This is a spin on an old family recipe, which I'm sure is just more of a cultural thing than something passed down through the ages and sages. The recipe is for Garlic Chicken Wings which is what my mom always called it, and as far as I know, my dad. My niece calls it Chinese Chicken. I think the more commonly known term today is Chicken in Black Bean Sauce. I used to think the black beans were just something that got tossed into the mix, but they're the special ingredient that makes the dish what it is. I suppose what makes it a family recipe is that throughout most of my lifetime, my mom was the only person I knew who could make it. The recipe originates from my father, who emigrated from China, and died when I was 4. I now realize at the time, the recipe was part of the Chinese community and culture, and a minority in the small northern Ontario town I grew up in during the 70s. For all I know, it could have been the most popular thing on the menu at every Asian restaurant in the larger urban centers like Toronto, Montreal and Vancouver. But back then, we were the only people I knew who knew it, enjoyed it, and were befriended for it. Technology, television and travel have opened minds and mouths of millions and now black bean sauce is as common a household name as beans on toast. Turns out, it wasn't a family secret at all but just a sign of the times when we were among the few that knew the recipe and where to get the 'stuff'. We had a friend who made trips to Toronto for supplies for the local Asian restaurants and community. Today, the family 'secret of the black beans' is spilled all over store shelves and the net. The recipe was passed down to my siblings and I, and we pass it on to our friends, as our mom did with hers. And to my pleasant surprise, most people I meet still haven't heard or tried my mom's infamous Garlic Chicken Wings, a.k.a. Chicken Wings in Black Bean Sauce. But I have noticed however, that black bean sauce, more specifically Tofu in Black Bean Sauce, is well known throughout the vegetarian community. Since becoming a vegetarian, and my recent return to becoming a vegetarian, I've made one slight change to the recipe. I replace the chicken with deep fried tofu. Everything else remains the same. 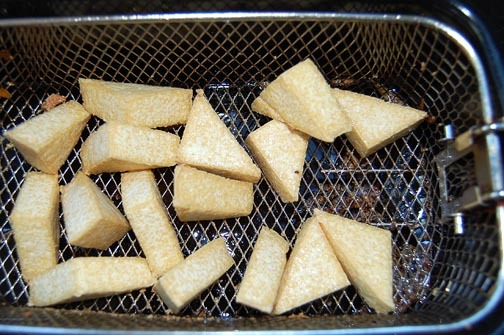 I got hooked on deep fried tofu when I worked in a Chinese restaurant in southern Ontario. I was a committed vegetarian back then, and the cooks were most accommodating. Deep fried tofu with mixed vegetables and hot sauce became an almost daily occurrence. And now deep fried tofu finds it's way into all sorts of places on my menu. I've pan fried my tofu over the years in oil, but with the acquisition of a deep fryer two Christmases ago, I've enjoyed the real deal and many versions of it since. And I confess as a struggling vegetarian, if you love hot dogs (real, not fake) you'll love them more out of the deep fryer. Just plop them in and wait til they float and you're good to go. Beware, they hold the heat and flavor for a very long time. 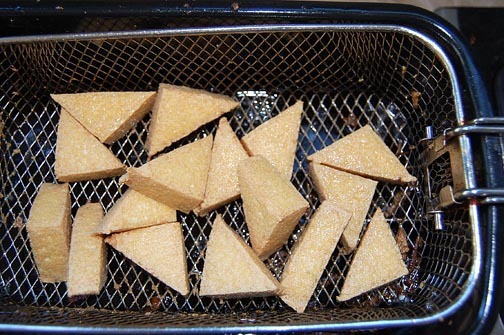 Margaret has become my number one fan of the deep fried tofu, and has mastered the recipe herself. Many friends and family have explored and enjoyed my vegetarian version alongside mom's original during the annual feasts we have here Chinese New Year. To spare you the drivel if you need to print this or come back for future reference, the methods and recipe below are in the 'Recipes' page. (Mom's Turning Over in Her Grave Right Now). 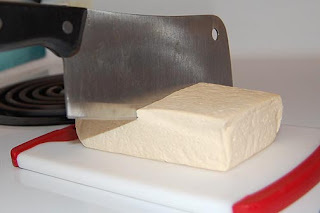 Firm and extra firm tofu works best since you'll be cutting it into small triangles. Anything softer is difficult to slice and work with in this form but it can be done with medium if it's all you can find. Just be more gentle when pressing it to remove the excess water. 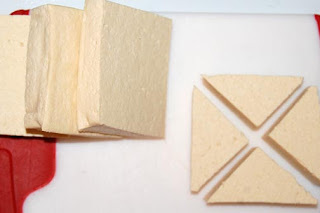 Slice open the package, drain, and remove the block of tofu. It will still be soaked with water and you'll need to apply pressure to squeeze out the excess. 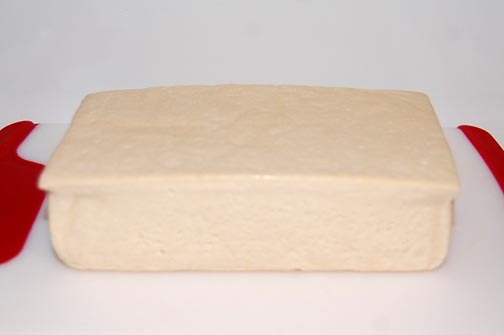 There are specially designed tofu presses on the commercial market that range from mini bench vises to plastic spring loaded food presses (Amazon), but most people just wrap it in a towel and place a towel wrapped brick or book on top of it. The longer you leave it, the more it will drain. Overnight in the fridge is ideal if you have the time and memory - I possess neither. Just do the best with what you can. I wrap my block of tofu in a cotton tea towel and place it between two plastic cutting boards. I either stack a couple books on it, or leave it in the sink and place a large heavy pot on top. The sink is just for balancing the pot. Remove the weights and towel once you're happy with the amount of moisture removed, or right now if you've lost track playing XBOX and only have ten minutes before your girlfriend gets home from work and the gym. FYI - thrown and broken XBOXes make excellent tofu presses. PlaysStations, 360s and Wiis are just too light. Haven't seen one in some time, but it's safe to assume Pong or an old 8-track player have some weight too. and slice them down the middle. 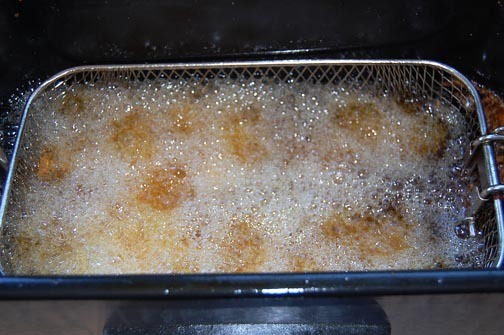 Set the temperature on the deep fryer to 350 degrees and wait for the green light. Place the triangles in the basket and lower into the fryer. Shake the basket vigorously to ensure the tofu doesn't stick to the bottom. Otherwise it will tear when you try to pell it out. Put the lid on, and keep shaking the basket every 30 seconds. 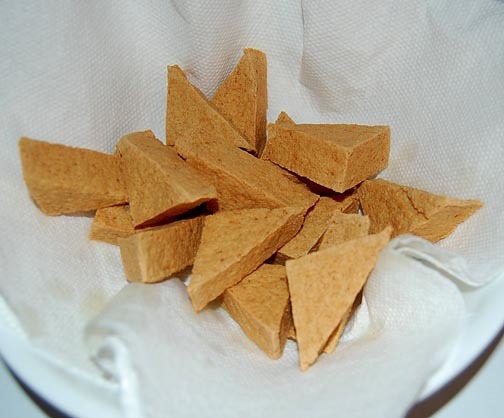 How long or crisp you prefer to cook your tofu is totally up to you. I've done from 90 seconds to 7 minutes and everywhere in between. 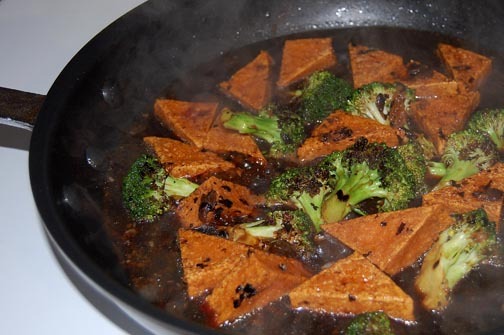 Keep in mind that the tofu will soak and soften a bit when you cook it in the black bean sauce. 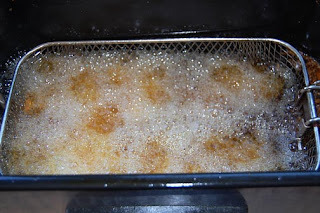 Remove the basket from the oil and let drip for a few seconds, then dump tofu onto a plate or bowl lined with paper towel to soak up excess oil. The main ingredient is the preserved black beans, not to be confused with the Mexican whole black beans. 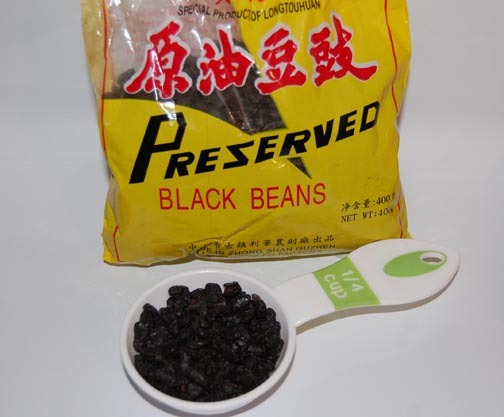 The fermented beans come dry in a cellophane pack, and are usually only found in Asian food markets and stores. The prices range from 99 cents to just under a buck and a package goes a long way. Some large grocery chains may carry them. I haven't seen them here in northern Ontario, but I have seen the prepared Black Bean Sauce in jars if that's all you can get. I haven't tried the stuff as of yet but hear it's a decent alternative. I'll do kitchen trials in the future. You can also order them online through Amazon. I've also gone to my local Asian restaurants and asked them to order them for me, and they've been very accommodating. Like my mom, my hand is the measuring instrument and just a palm full will do. If you choose to use measuring spoons and cups, 1/4 to 1/3 cup ranging on your tastes. Pour the beans in a bowl, and rinse and drain them under cold water. Then soak them for 5 minutes in just enough water to cover them. Make a fist, and gently mash them under your knuckles til they're somewhat pasty. Add a cup of water, 1/4 cup of soya sauce, stir and set aside. 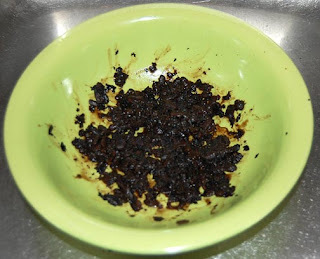 Heat up oil in a skillet and saute chopped garlic for 30 seconds then add the black bean sauce. Cover and let simmer for 2 minutes. 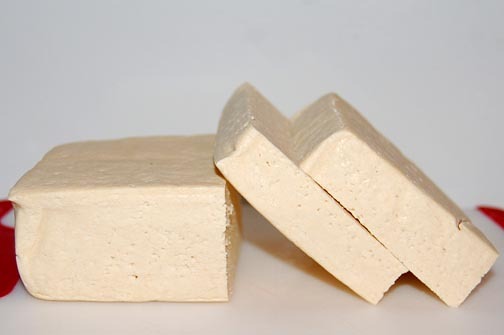 Add tofu and stir, then reduce heat to low and leave covered for 5 minutes stirring occasionally. Stir fry your vegetables of choice in a separate pan with oil and preferred seasoning. For this recipe, I charred broccoli spears in a dry non-stick pan. 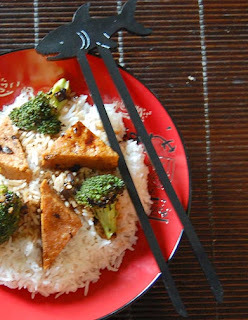 When done, you can add them to the tofu, serve them on a platter with the tofu on top, or serve it all together on a bed of noodles or rice. I love recipes that are passed down from family. 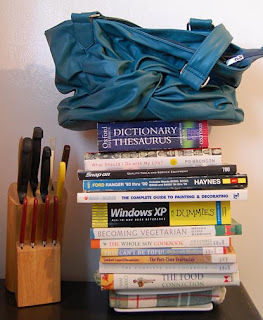 I also like your measuring style. I am more of a go by sight kind of gal, the palm method works too. Great recipe! Thanks Clarkie! Any hint of measurement is more for my visitors than anything. I usually just eyeball the amounts myself as well. Congrats on your marathon. Maragret has been running 5k's this summer and can definitely relate to those highs and lows. We're on the Dailymile as well. We'll look for you and cheer you on.